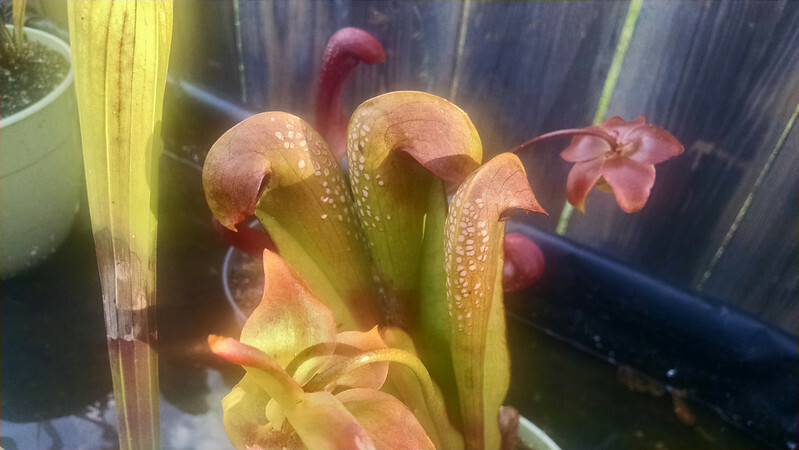 Backyard Sarracenia update |Sundews Etc. I've been spending more time indoors with my pings and sundews lately, so I decided to have a look at what's going on outside. The light was a little funny, so the pictures are a bit funny. At least this Sarracenia minor looks sort of cute with that soft hazy light. This is one of the prettiest pictures I've seen of my S. minor. Really nice color on these pitchers. I love the orange and green with the white fenestrations. 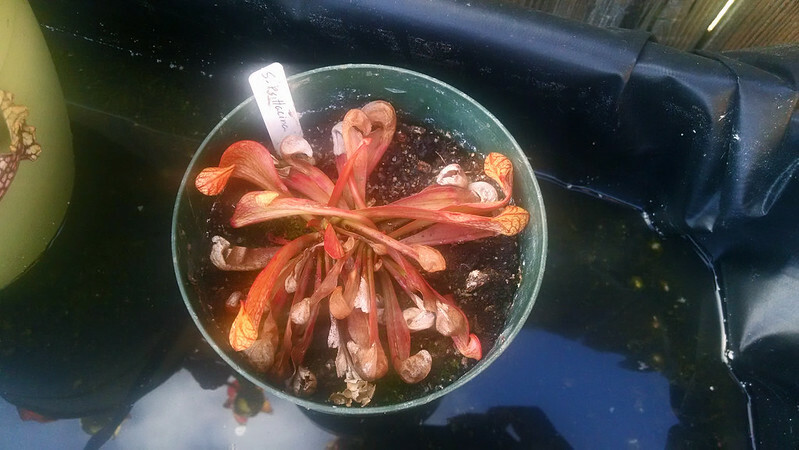 My Sarracenia purpurea has also fleshed out and colored up, so that all the bird damage from last year is gone. I could probably afford to size up the pot again as well, but I can't imagine that happening before next year, hahahah. 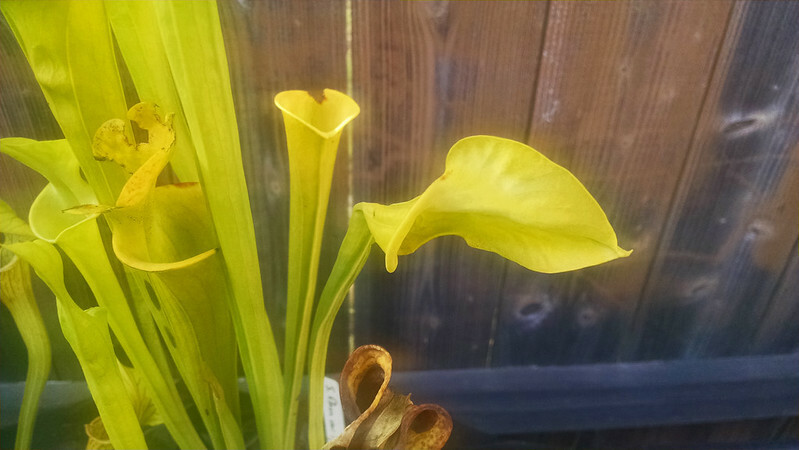 This is a clone I got from the Cactus Jungle that they're calling Sarracenia "Rosy Reptile", since it's apparently the same cross as the famous Sarracenia 'Reptilian Rose', but a different selection. Kind of a flamboyant pitcher. I like that. 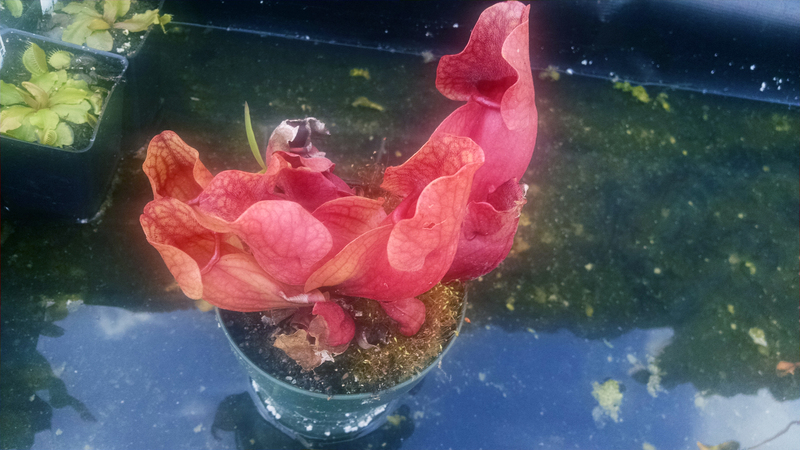 S. 'Reptilian Rose' is Sarracenia oreophila "Sand Mountain" × 'Royal Ruby' (which is a natural S. ×moorei selection). I wasn't clear if this means that S. "Rosy Reptile" is a different selection of the actual cross that produced S. 'Reptilian Rose', or if someone reproduced the cross and selected this clone. I'll have to ask Anne for clarification. In any case I dig those red lips and the big pitcher lid. I'm getting some color on Sarracenia psittacina, but I really need to pot it into something larger, since it's getting a bit cramped as is. I've got at least two divisions in there too. Excited! 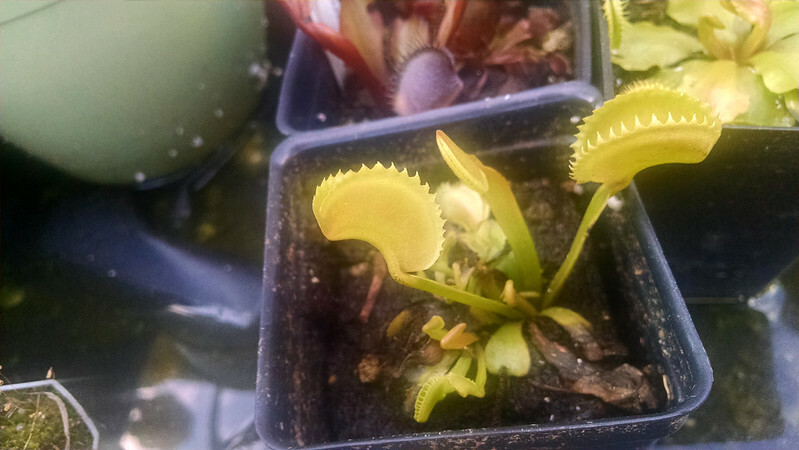 I got several Venus flytraps during the NASC auction, and this Dionaea 'Dente' was among them. Dionaea is a pretty cool genus I guess. The rest need to recover some more from shipping, but this one's looking good! 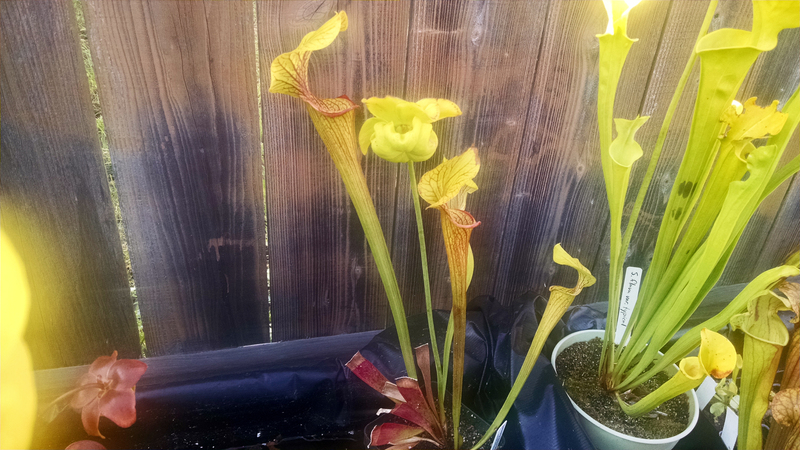 I've got a total of 3 pitchers on Sarracenia ×formosa now. That's not a lot, but they're really pretty. Not as big as they were at the end of last season. We'll see! This plant is fairly low-profile and sturdy, so it bears the high winds we've had lately fairly well. 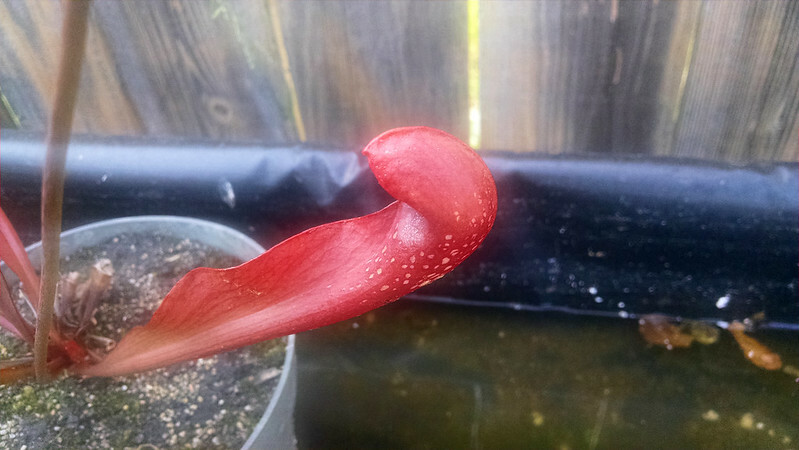 Alas, the same cannot be said for the taller plants, and this Sarracenia flava pitcher has paid the ultimate price. The Carnivore Girl and I both have derpy S. flava now. Feels good man.